Research Areas: Petrogenesis of igneous rocks; U-Th disequilibrium; ND, SR, Pb and O isotope and trace element geochemistry; chemical geodynamics; East Asian geology; time scales of magma chamber processes; volcanology; quantitative geochemical modeling; mass spectrometry, including thermalionization, secondary-ionization, and plasma-ionization mass spectrometry. 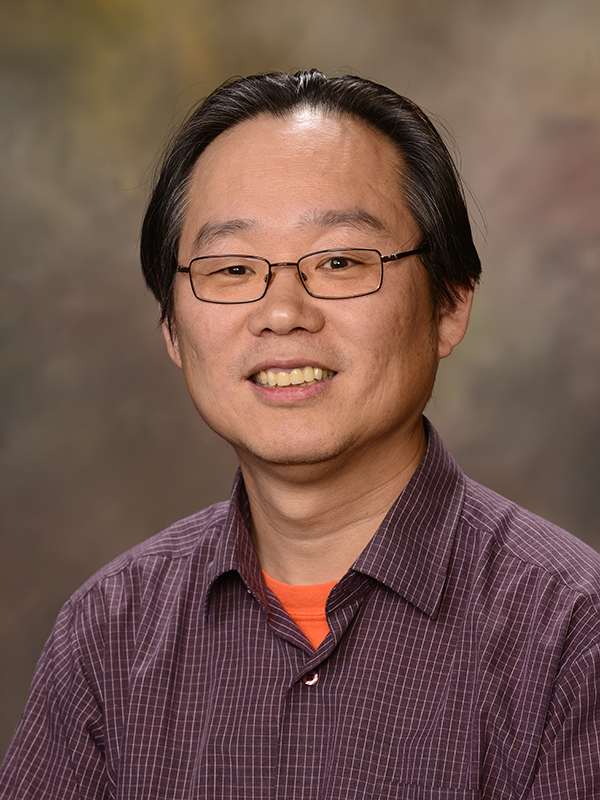 Haibo Zou teaches Physical Geology and Igneous Petrology at the undergraduate level as well as graduate courses in igneous petrology and geochemical modeling. Dr. Zou's varied research interests include the petrogenesis of igneous rocks; U-Th disequilibrium; Nd, Sr, Pb, and O isotope and trace element geochemistry; chemical geodynamics; East Asian geology; time scales of magma chamber processes; volcanology; quantitative geochemical modeling; mass spectrometry, including thermal-ionization, secondary-ionization, and plasma-ionization mass spectrometry. He has an active NSF-funded project, “Melting Beneath Continents in Diffuse Igneous Provinces.” More specific research interests are given as follows. (1) Petrology and Chemistry of the Earth and Planets The goals of this study are to achieve a better understanding of the differentiation and chemical evolution of the Earth and other planets, the geochemical aspects of crust-mantle interaction, the dynamics and evolution of magma systems, and the formation of the crust and the process of weathering, through the integrated study of isotopic compositions (Sm-Nd, Rb-Sr, Lu-Hf, and U-Th-Pb isotopic systematics) and traceelement concentrations and ratios in igneous, sedimentary, and metamorphic rocks. The main tools in this research are 3 types of mass spectrometers: thermal ionization mass spectrometers, secondary ion mass spectrometers, and inductively coupled plasma mass spectrometers. Mass spectrometry has wide applications in almost all the fields of natural sciences, including Earth and space sciences, and life sciences. (Essentially, there is no boundary between the different fields of natural science; there is only overlap between disciplines. Interdisciplinary research is the way to go). My recent work has focused on the use of long-lived isotopes, extinct short-lived isotopes, and equations to study (1) mantle dynamics and processes using uranium-thorium isotopic disequilibrium, (2) early (Hadean) Earth and moon and other terrestrial planets, and (3) early solar processes. (2) Geochemical Modeling Just like mass spectrometry, mathematics has broad applications in all fields of natural sciences. To quantify physical, chemical, geological, and biological processes is always an important goal in natural sciences. The main tools in this part of my research are ordinary and partial differential equations with initial and boundary conditions, and numerical analysis. The fascinating aspect of mathematical modeling is a deep understanding of not only mathematics but also the related knowledge of physics, chemistry, and geology. Recently I have been working on models to describe trace element fractionation and uranium-thorium disequilibrium during the processes of melt generation and transport. I also wrote a book, "Quantitative Geochemistry," for graduate students and researchers. (3) Paleoclimates Constrained from Hard Rocks Although much of my early research focuses on deep Earth processes, my recent research has been extended to Earth surface studies of Miocene paleosols (Zou et al., 2004) and Neoproterozoic glaciations (e.g., Xu et al., 2005; Xu et al., 2008), as the powerful tools that I have learned (isotopes, trace elements, clean-lab chemistry, mathematics, programming languages) are useful for the studies of not only deep processes but also surface processes. As a byproduct of the research on continental basalts, we demonstrated that the unusual tridymite-hercynite xenoliths in Niutoushan basalts represent preserved aluminous lateritic paleosols, which are not genetically related to the host tholeiites. These lateritic paleosols with strongly desilicated minerals were formed by intense chemical weathering under warm and humid tropical conditions in SE China during the interval from 17 to 15 Ma. The formation age of the paleosols corresponds to a period characterized by slow uplift of the Himalayan-Tibetan Plateau region (and thus less consumption of CO 2 ) after 17 Ma, and eruptions of the 17-15 Ma Columbia River flood basalts, the Vogelsberg basalts, and the East China basalts (and thus more input of CO 2 into the atmosphere). The tridymite-hercynite xenoliths in the Niutoushan basalts thus preserve novel evidence of extraordinary climatic greenhouse conditions in the middle Miocene that would otherwise have been lost by erosion of the paleosols (Zou et al., 2004). In favorable circumstances, hard rocks may contain useful information about paleoclimate conditions! My approach to research is to combine accurate measurements by mass spectrometry with solid mathematical modeling. I pay special attention to quantitative models, innovative experimental methods, and bold/creative (sometimes a bit crazy) interpretations. A combined experimental and theoretical study can solve scientific problems more thoroughly and elegantly. Zhang, C. L., Zou, H. B., Zhu, Q. B., Chen, X. Y. (2015) Late Mesoproterozoic to Early Neoproterozoic ridge subduction along southern margin of the Jiangnan Orogen: New evidence from the Northeastern Jiangxi Ophiolite (NJO), South China. Precambrian Research, v. 268, p. 1-15. Zou, H. B., Shen, C. C., Fan, Q. C. and Lin, K. (2014) U-series disequilibrium in Tengchong volcanics: Recycling of mature clay sediments or mudstones into the SE Tibetan mantle. Lithos, v. 192-195, p. 132-141. Zou, H. B., Fan, Q.C., Zhang, H. F. and A. K. Schmitt (2014) U-series zircon age constraints on the plumbing system and magma residence times of the Changbai volcano, China/North Korea border. Lithos, v. 200-201, p. 169-180. Zou, H.B. (2014) Error propagation. In: Holland H.D. and Turekian K.K. (eds.) Treatise on Geochemistry (Second Edition), v. 15, p. 33-42. Zhang, C. L., Zou, H. B., Santosh, M., Ye, X. T. and Li, H. K. (2014) Is the Precambrian basement of the Tarim Craton in NW China composed of discrete terranes? Precambrian Research, v. 254, p. 226-244.